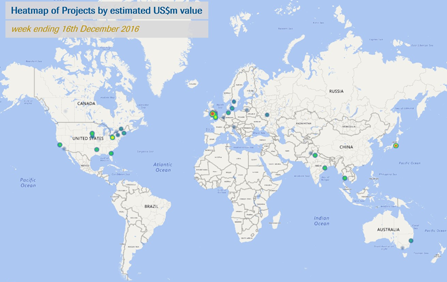 In the week ended 16th December 2016, AcuComm added 4 new or updated projects to our Business db, worth an estimated US$3,399 million and waste capacity of just over 9.9 million tonnes. MSW was the leading feedstock type reported on in the past week, accounting for an estimated 2.7 million tonnes, or 40.1% of the total. This was followed by waste biomass with just under 2 million tonnes. The leading country in the past week was the USA with 12 projects. This was followed by the UK with nine and Canada with four. AcuComm’s practical sales information for the Waste, Bioenergy and Recycling sectors is allowing organisations all over the world to identify the opportunities that are right for them. Just some of the industry-leading companies using AcuComm to drive their business growth include M+W Group, Veolia, JCB, Viridor and Eggersmann Group. To discover the benefits these companies are experiencing, book a demo today. Coltrade (part of Colsen Group) and its partner Ahidra have begun construction of one of the largest agro-industrial biogas plants in the world within the dairy industry, located in Asturias. Once construction is finished, the start-up of the plant is planned for the second quarter of 2017. Construction has begun on a new £25 million energy plant that is claimed to be the world’s first commercially viable facility to convert household waste to bio-substitute natural gas (BioSNG), which emits 80% less carbon dioxide than diesel. The plant is being built by gogreengas, a partnership between Advanced Plasma Power, National Grid and Progressive Energy. In the week ended 9th December 2016, AcuComm added 41 new or updated projects to our Business db, worth an estimated US$6,900 million and waste capacity of just under 11.1 million tonnes. The cumulative total of projects in our database is now estimated to be valued at US$352.2 billion. WtE incineration was the largest category in terms of waste capacity, accounting for just under 3.7 million tonnes. The leading country in the past week was the USA with ten projects. This was followed by the UK with seven and Finland with four. With total projects in our database nearing 5,000, there could be a number of business opportunities awaiting your organisation. To put our database to the test, simply visit our Search page and define your project criteria. Alternatively, you can get in contact with a member of the team today to book a demo. GEP Fuel & Energy Indiana, a joint venture between U.S. Energy Logistics and GEP Fuels, plans to invest around US$300 million in Camden, Carroll County, IN, by 2020. The company will build a 650,000 square foot recycling centre to refine recyclable and non-recyclable waste plastic into commercially-viable products. GEP Fuel also plan to construct a plastics-to-diesel facility. Shenzhen Energy Group is to build the world’s largest waste-to-energy facility in Shenzhen, Guangdong Province. Babcock & Wilcox Vølund has been awarded a contract for nearly US$40 million to design a boiler for the project. B&W Vølund will also supply equipment, including a Dynagrate combustion grate system, hydraulics, burners and other boiler components for the 168 MW plant. In the week ended 2nd December 2016, AcuComm added 43 new or updated projects to our Business db, worth an estimated US$7,027 million and waste capacity of just over 10.4 million tonnes. 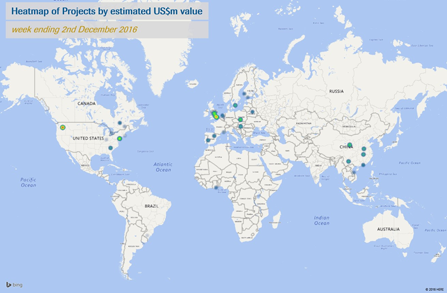 The total estimated investment value of projects in our database is now at around US$352.3 billion. MSW was the leading feedstock type reported on in the past week, accounting for an estimated 5.7 million tonnes, or 55.1% of the total. This was followed by wood with just under 1.5 million tonnes. The leading country in the past week was the USA with ten projects. This was followed by the UK with seven and China with six. If your organisation is looking to understand the trends driving the Waste, Bioenergy and Recycling sectors, then why not sign up to one of AcuComm’s Packages? To find out more and to experience the benefits for yourself, book a demo with one of the team today.